I didn't put a lot of hardware or bling on this ATC because I liked the simple elegance of it. 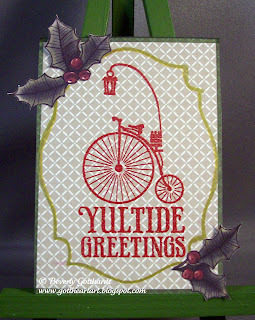 I'm really loving the Stampin' Up Cherry Cobbler embossing powder, heats up very crisp. We're coming into the home stretch for Santa arriving. I can smell all the cookies baking from here. Whatever you celebrate this season have a Happy! I agree, I really like the simple elegance of the card. The image and colors speak for themselves! A very clean & classy looking ATC!! Love the vintage stamped image! So glad you have joined us again at Wicked Wednesday!!! Lovely vintage style Christmas ATC!